Today marks 10 years since my life was changed by what I would later learn was encephalitis. Looking back, I had no idea how it would impact me. Nor did I ever imagine good things that would come of it. A sense of belonging: my circle of friends has grown tremendously as I have met hundreds of others impacted by encephalitis. I especially was touched by a young girl named Rylee Kinnett in Florida who put up a long battle with West Nile encephalitis. I’m better for knowing her beautiful, resilient smile … for showing us that it’s possible to push hard through horrific complications and still find the strength to smile. Young Rylee joined the angels just yesterday and I’m grateful to have witnessed her courage. My heart will always hold a sweet, gentle place for her and so many others impacted by encephalitis that I’m proud to call friends. A sense of purpose: until I was diagnosed with encephalitis, I had never heard of this illness. I recall being so damn happy that I didn’t have a stroke, only to learn that stroke would have had an easier path forward. Because there’s so little research and knowledge about encephalitis, there is largely no specific treatment and often insurance denies coverage for what typically results in a brain injury. Yes! We get sent home as if we’ve had the flu and yet most frequently it’s a brain injury. This has given me a sense of purpose to put this life-changing illness on the map, thus the recent launch of Encephalitis411.org, which aims to improve the lives of those impacted by encephalitis, backed by the medical community. A reason to slow down: most people impacted by encephalitis will never return to their “base line” again. So when we have a good day and overdo it because we aren’t plagued by fatigue, our bodies nearly shut down because the fatigue returns tenfold. This has forced my Type A body to chill … to slow down and enjoy life and not try to cross everything off my long list in one day. My dad and I have learned this the hard way. A thirst to see the world: when I thought I was dying, it fueled an energy to see the world. I lived life fast … going to different places like Hawaii, Australia, Puerto Vallarta, Galapagos Islands, Canada and tromping across the U.S. to see friends … mostly with my sister, who has been a constant encouraging voice. These adventures have opened my eyes to the value of discovering other cultures and appreciating what I took for granted. The ability to cross off bucket list items: ever since I was a child, writing a book was a dream … except I lacked a topic or storyline. That’s a problem! Once I was diagnosed with encephalitis, however, it opened my eyes to such little awareness of this illness. This gave me that needed storyline and a passion to educate. Writing Brain Wreck, which became #1 on Amazon in its category in only the first 4 months post publication was a dream come true. What I hadn’t anticipated was the number of people who reached out after reading it to tell me how it impacted them personally. That was an unexpected reward of the fruits of my labor. The need to save for the unexpected: being raised by frugal parents, I learned that saving wasn’t a choice … it was a necessity. And for 10 years straight now, I’ve met my medical deductible within the first 45 days of the new year. It’s one thing to save for your kid’s college or for that next dream trip. But having chronic illness from a brain injury, in my case, has been a new cause to ensure the bank account can handle the next curve ball my health throws at me. This illness financially ruins many families. I’m grateful we had the means to cover the expensive … I mean, expenses. The pure pleasure of family and friends: although I’d like to think I didn’t take these important relationships for granted, I live more on purpose with them now. Put away the cell phone and listen. Make more direct eye contact so they know they’re being heard. Thank them for each small way they help me compensate. Tell them I love them more often. My “hubbinator” has been there by my side through this journey that I don’t wish on anyone. The return of my faith: as someone who thought they’d be a youth minister early in life, I sure went way off course, turning my back on the church for at least a decade or more. I’m less ashamed of this now because I was only human … blaming God for bad things happening to a “good” person. Now that I’m back on track, it feels so good to know that when nothing else is going right, God is still taking care of me and those moments of despair are now infrequent. The discovery of new talents: anyone who knows my mom knows that she’s one of the most creative and talented people to walk this earth … sewing, painting, drawing, quilting, playing the piano, making glass mosaics and then some. She opened my eyes to painting …. a talent that I never knew I had that’s so relaxing and rewarding (usually). My band directors from childhood would have been thrilled if I could sightread music back then like I can now. Who knows what changed in the brain to suddenly have these capabilities?! So I’m raising my glass first to the fighting spirit of Rylee Kinnett who brought so many smiles to those of us following her these past few years … now soaring with the angels without pain. And to her mom, Shara Love, for being supermom. They are the heroes of encephalitis … determined and smiling despite the weight of it all. And I also toast to 10 years of surviving encephalitis … with a renewed spirit, hope, new friends and resolving the past. If you found any meaning in this, I welcome you to follow this blog and join me for the continued ride. 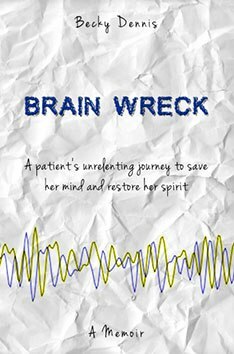 Haven’t read “Brain Wreck”? Most people impacted by encephalitis find it a real boost. Hopefully you will, too. That was really nice Becky, thanks for sharing!